Quarterback Aaron Rodgers is 35 years-old weighs 102 kg (225 lbs) and has a height of 6’2” (188 cm). His vegan diet has helped him maintain an athletic figure of 47-16-37.5. Aaron Rodgers, star quarterback for The Green Bay Packers, was always in a good shape and the guy managed to look his usual muscular at the 2017 Kentucky Derby. Being the Super Bowl XLV Champion and Super Bowl Most Valuable Player. Aaron Rodgers is also known for being a two-time NFL MVP in 2011 and 2014. Aaron Rodgers follows a vegan diet for the most part, as he recently revealed in interviews. The quarterback says that this is part of his long-term nutrition plan, which he hopes will help keep him leaner and allow him to play football longer. 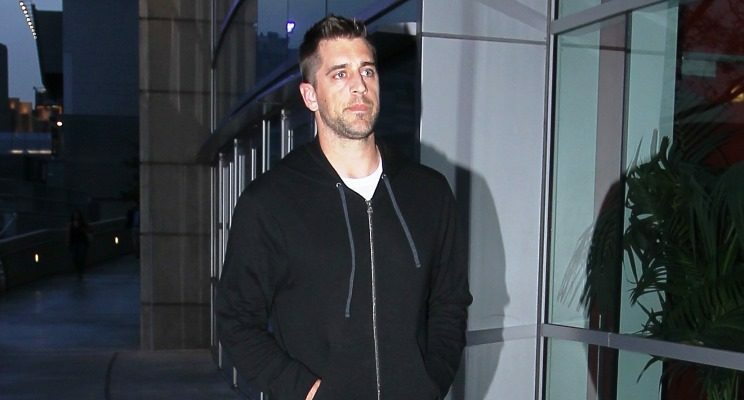 Flaunting a slimmer look, Aaron Rodgers’ weight loss already seems to be in effect. Aaron Rodgers says that he now weighs 217 pounds, which is his lowest weight since 2007. Prior to losing weight, Rodgers weighed around 230 pounds. He expects that this weight loss will help him perform better on the field. Working with The Green Bay Packers’ nutritionist, Rodgers developed his new diet, which is mostly vegan. His diet limits most animal products, although he says that he does allow himself to cheat every once in a while. Dairy products have been completely eliminated from his diet, including cheese and milk. He has also cut down on the amount of meat that he eats, although he does still occasionally enjoy some red meat or chicken. Most of the time, he eats fruits and vegetables. He says that most of his diet consists of vegetables, although he didn’t reveal any further details about the meals that he eats. While some people believe that vegan or vegetarian diets are unhealthy or inadequate for athletes, a growing number of experts say they can be a healthy choice. In the past, there was concern that vegan diets could not provide adequate protein intake. Protein is essential for building muscle and providing energy for workouts. Meat is a rich source of protein, but vegan diets can still provide a healthy amount of protein through beans and other legumes. While many people feel that they need to eat meat to stay in shape, Rodgers is proof that even top-level athletes can eat a vegetable-rich diet. Rodgers supplements his diet with protein shakes and multivitamins, which give him an added boost. He says that by eating more vegetables and avoiding animal products, he can reduce inflammation in his body, allowing him to heal and recover better. This isn’t the first time that The Green Bay Packers star has surprised his fans. A couple years ago, Aaron Rodgers’ shocked fans when he revealed that he used hot yoga to detoxify his body and clear his mind. He also tried juice cleanses and has replaced stimulants (like coffee) with more water. Rodgers also focuses on working out. He makes sure to get at least seven and a half hours of sleep each night. The football star believes that this will help him keep playing professional football well into his 40s. If you are impressed by Aaron Rodgers’ current weight and want to slim down, then a vegan diet may be the right choice for you. By eating more vegetables, getting lots of rest, and cutting out unhealthy foods from your diet, you can stay slim and fit.